One of the most ancient customs in religious and spiritual practices, is the burning of granular incense. It has always been believed that to scent the atmosphere with fine, rare and exotic fragrances will attract the Gods, Angels and good spirits. If you have never burned granular incense before, then this is the kit for you. 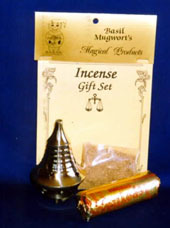 A complete kit containing everything you will need for burning granular incense. One 10gm pack of our handmade granular incense. One brass 6-8cm incense burner. One roll of 6 charcoal disks.